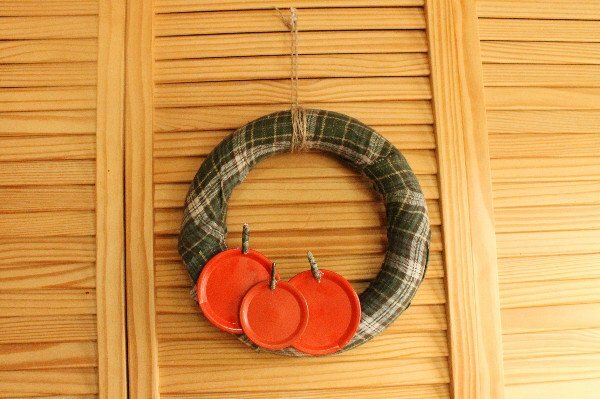 This adorable and easy Upcycled Jar Lid Pumpkin Patch Wreath is the epitome of fall to me! Fall for me equals things like pumpkin, flannel, and natural elements to decorate the home, this project allowed me to indulge in all three! I am also big on upcycling so I try to incorporate found items around the home as much as possible in all my craft projects, I was able to use some slightly rusted mason jar lids and a big scrap piece of flannel fabric from my stash so it made it very frugal as well. Grab a few items from around the house and a wreath form from the Dollar Tree to put together this fun and simple fall decoration. Wrap flannel around wreath form, securing with hot glue- be sure to not touch the metal tip of the glue gun to the foam it will melt away, keep raw edges to the back side of your wreath when possible. You can also use a spray adhesive to attach fabric to wreath. 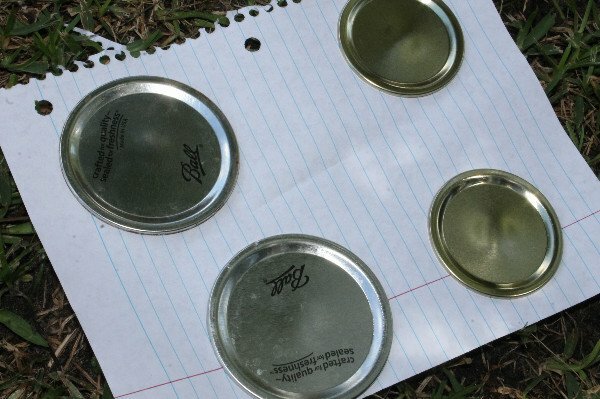 Take mason jar lids outdoors to well ventilated spot and spray well with 2-3 coats of orange paint, allow to dry thoroughly. 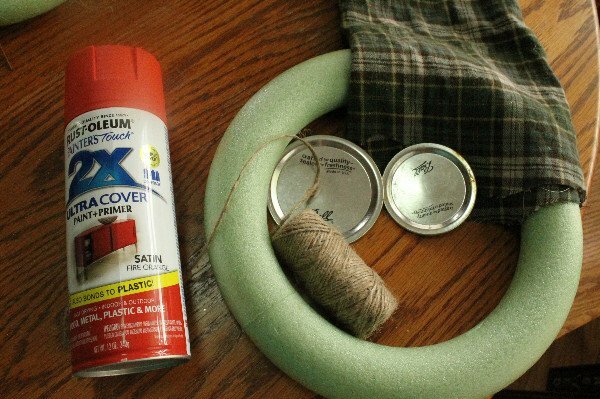 Glue the backside of jar lids to flannel covered wreath. You can do as few or as many as you like- put one on for each member of your family, or create a full patch all the way around. You could even personalize them with a sharpie if you want. To make them look a little more like real pumpkins hot glue a small piece of twig to the top for a stem. Wrap twine around top 4-5 times, leaving the loops loose for hanging. 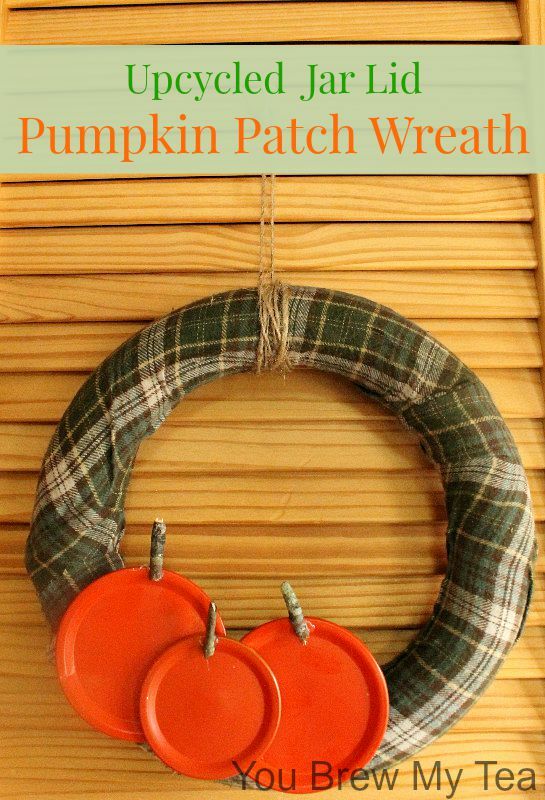 I love the plain and simple look of this upcycled jar lid pumpkin patch wreath, but you can get as creative as you like and add any fall embellishments you have on hand- wheat, silk leaves, acorns, etc. You are only limited by your imagination. This is a great craft to make with your kids, as well as to give as gifts to your friends, family or even school teachers. We love inexpensive crafts, and especially things that can upcycle what we already have on hand. 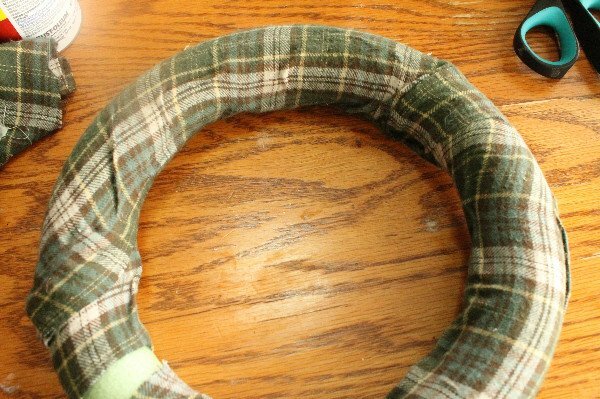 Wearing flannel in the winter months is common for many, so an old flannel shirt can quickly be turned into a fun project like this. You could also use something like corduroy, burlap or simply any fall colored fabric. We love these other super easy and fun fall themed crafts that are great for giving your home an all new and beautiful look for the season! My friend Katie from The Homespun Hydrangea made this super cute idea for Homemade Patriotic Crayons For 4th Of July the other day. She was nice enough to share her tutorial and some great pictures with us to share here with you. I love her fun crafts and ideas for kids, and of course these are perfect for kids of all ages to make. 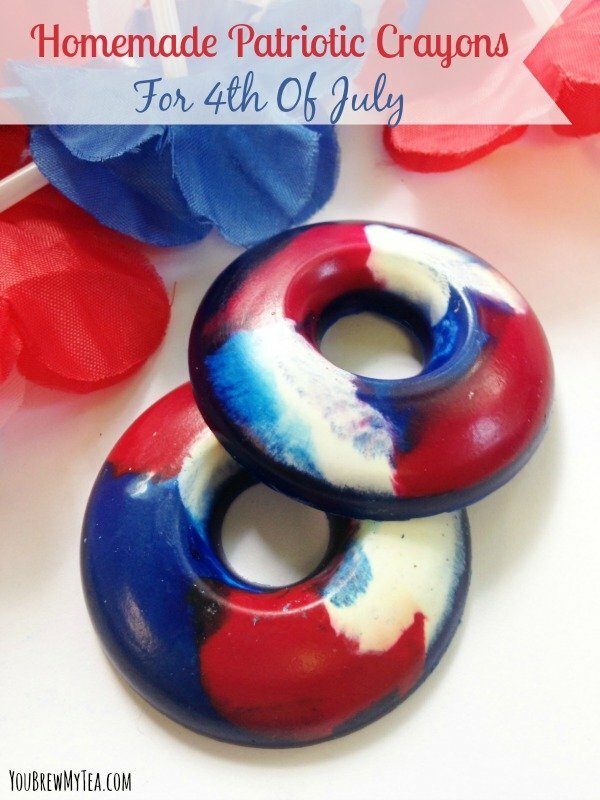 This is a great idea for your preschool kids to help you make ahead of time,or even a fun craft idea for your 4th of July party! 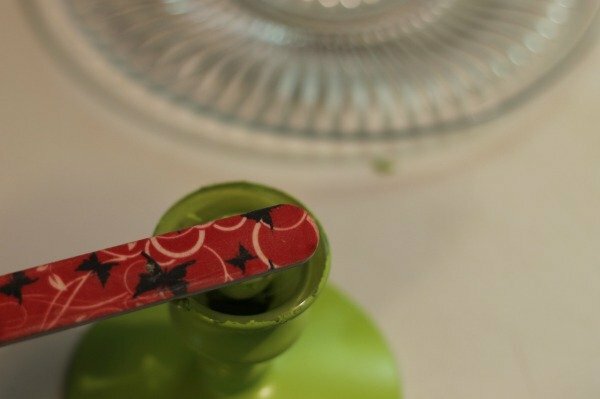 This is something you can probably do already without having to buy any supplies, but even if you have to make a trip to the store, this is a really frugal project for your kids to make. You can use a muffin tin or a donut tin, but we love grabbing the aluminium muffin tins at the dollar store for these. Inexpensive and no worries about a mess to clean up. 1. Begin by peeling away the wrappers on all of the crayons. Make sure all wrapping is removed thoroughly. 2. Break the crayons into smaller segments. You want them to be about ½ an inch in length or less. 3. Preheat the oven to 350 degrees. Spray the muffin or donut tin with non stick cooking spray. 4. Drop the crayon segments into the trays. You want to create one layer with the crayons. 5. Continue adding crayon segments until the tin is about 1/3 full. Place in the oven for 10-12 minutes or until melted into a liquid. 6. Remove the tray and allow to cool. Transfer the tray to the freezer where it will rest for 10 minutes. 7. Remove the tray from the freezer and turn over to remove the crayons from the mold. I love simple crafts like this one. 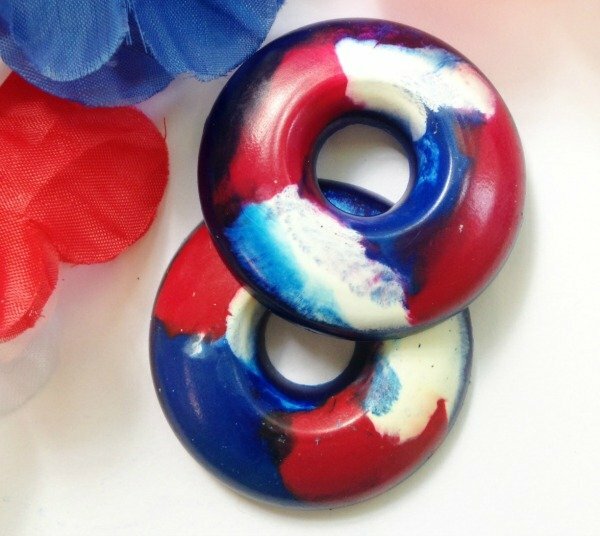 These homemade patriotic crayons are a great idea for the 4th of July. Get your kids to help you make them, then line the tables at your party or barbecue with butcher paper. Place these crayons on the tables and encourage people to draw pictures, color or leave notes behind. It’s a fun way to get everyone involved and the kids to feel like they are a part of the celebration. Check out some of our other favorite easy crafts for kids to help with! 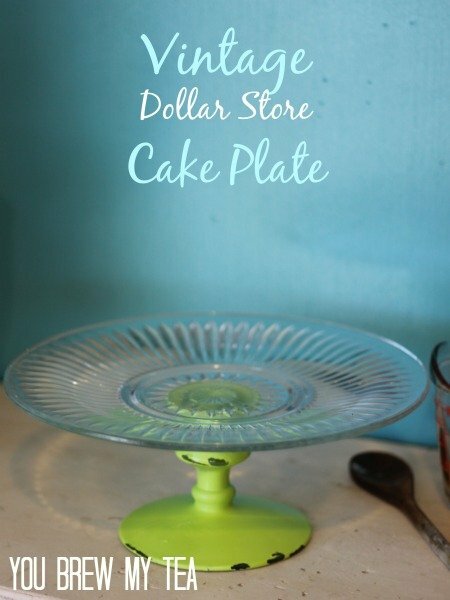 This DIY Vintage Cake Plate is just the kind of upcycled project I live for! Whether it is an item found at a yard sale, thrift store, or yes – even the Dollar Store, I love making fun upcycled items. There is a thrill in taking something old or plain and turning it into something beautiful. Frames, knick knacks, plates, whatever. There is a charm and self satisfaction in upcycled pieces you create that you wont find in high end home goods stores. Spray paint is another favorite of mine, a quick burst of color quickly changes a look, theme, feel of and object for just a couple dollars. 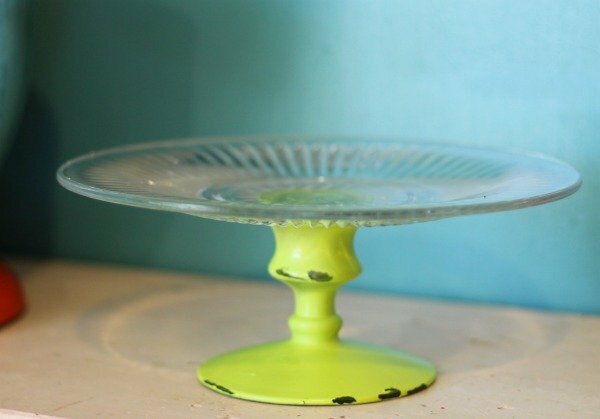 Finish it off with just a touch of aging and you have a beautiful vintage feel cake stand. Potlucks, summer barbecues or birthday parties need something beautiful like this vintage cake plate I made. I love being able to use simple inexpensive items to create something gorgeous for every day use. You can spend under $5 to make this great piece and use it throughout the summer months to throw parties where all of your friends will rave over where you found that beautiful piece! 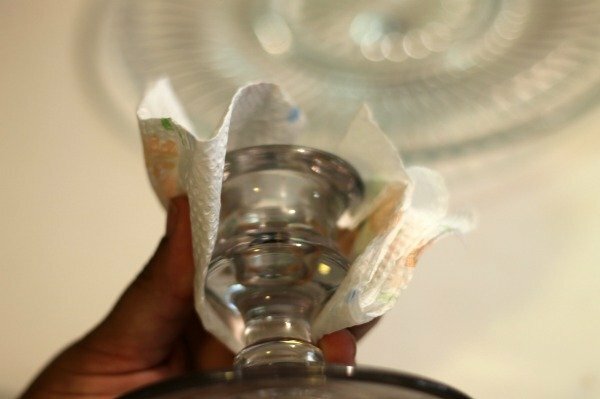 Begin by wiping down the surface of your plate and candle holder well with a paper towel dampened with alcohol. Allow to dry completely. Spray candle holder with a light coat of paint, dry for 5 minutes, apply 2-3 additional coats until desired coverage has been reached. Once completely dry spray with 2-3 coats of clear sealant. If you want to age it a bit like I did rough up the edges a little with sand paper before spraying on clear coat. Find the center of your plate, place your candle holder in the center and draw a ring around the plate, a dry erase marker is great for this. Sand inside the circle to create a more pourous surface, wipe away with alcohol. 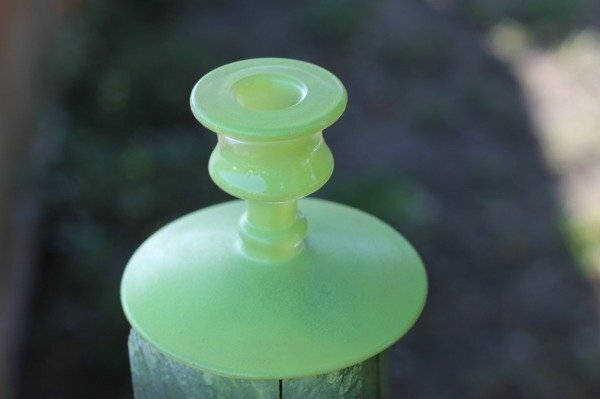 Do the same with the edge of your candle holder that will be attached to plate. Apply a generous bead of glue just inside the line. Press candle holder into plate and dry overnight. Your cake plate is ready for your next delicious and moist bundt cake or a tall stack of fresh baked chocolate chip cookies even! When not being used for cake you can add an arrangement of candles and flowers to it, use it in the bathroom for toiletries, or on your dresser to hold jewelry. This is the ultimate in cheap DIY, and especially awesome for those who are always looking for a great dollar store craft to make! Check out some of our other favorite crafts and upcycle projects! There is little that trills me like a thrift store find, unless its repurposing said thrift store find. 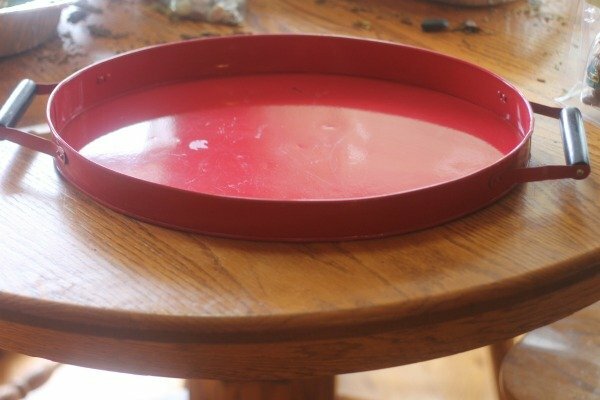 This Grown Up Gnome Herb Garden was something I knew would come together as soon as I found this bright red tray. The kids love their gnome and fairy gardens and will spend hours rearranging and setting up theirs with craft store purchased and homemade adorable furniture and accessories- so maybe I got a little jealous of all the fun and thought that kids shouldn’t have ALL the fun. So my tray was destined to become a Gnome/Fairy garden, and I thought it was also a perfect spot to root herbs. 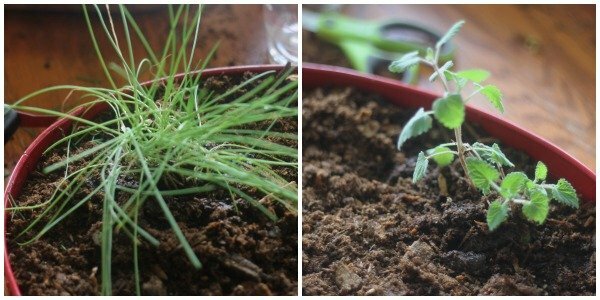 When my basil, chives, or other herbs start to get to bushy I like to pinch them back, dip them in root growth hormone, and stick them in some good soil. Once they get established I will then transfer the cuttings to the garden, a pot, or pass them on to friends and neighbors. gnome, fairies, miniature decorations, natural items – rocks, twigs, pincones, etc. Fill container with a good quality organic potting soil 1/2″ from the top. 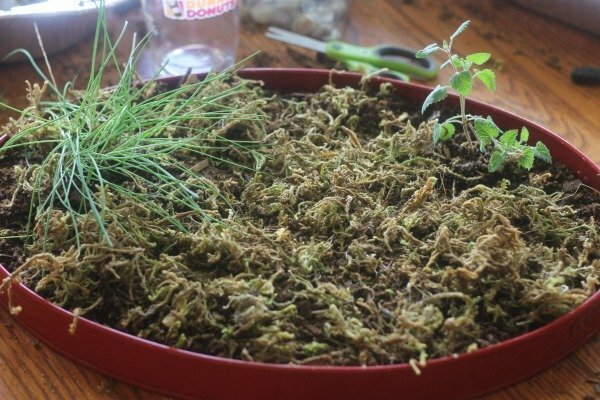 Place your plant cuttings or small starter plants wherever you would like them, do not overcrowd. Add a light layer of moss over your soil, this will help keep moisture in. Next add in some natural elements like stones and twigs to make it feel like a real enchanted forest. Finally add your mini fairies, gnomes, and accessories. I found this precious coffee cup and saucer in the dollhouse section at Hobby Lobby-coffee is anoter of my obsessions so I thought it fitting. 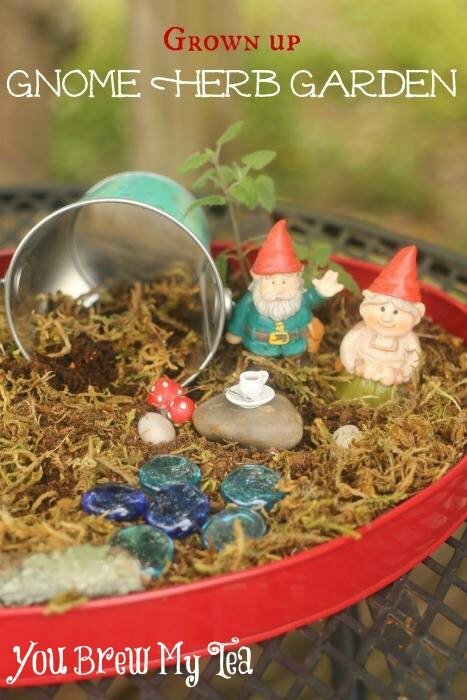 This sweet little gnome garden is great indoors or out, near a sunny window if in or a covered porch/ filtered sunlight if outdoors. To care for your plants add water so soil is just a little more than damp but not saturated, try to keep moist at all times for best results. Once plants begin to develop good roots they are easy to remove from container and translplant, leaving it ready for new cuttings. This can be done wit succulants as well. Looking for some gnomes and accessories for your garden? Here are some of my favorites! 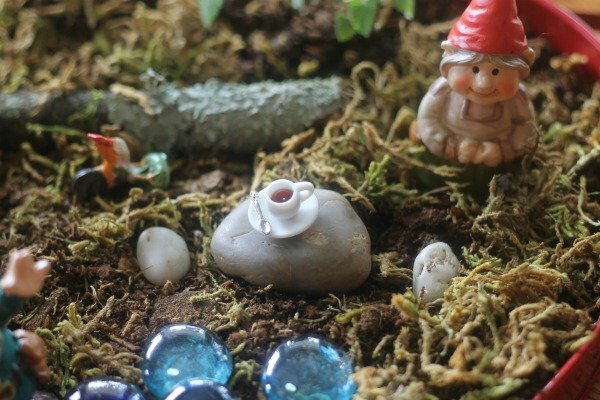 Get to creating and make your own version of a childs gnome or fairy garden! 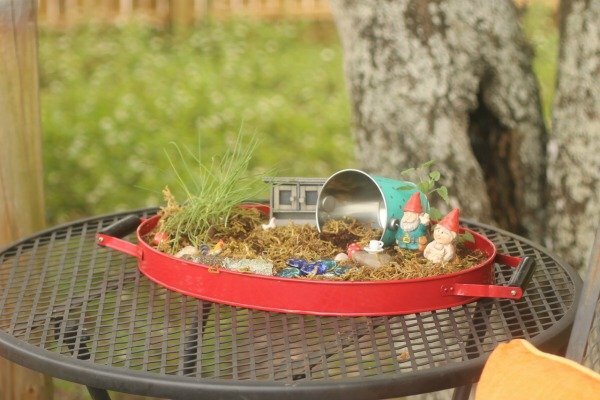 Since we love making fun upcycled items, Gnomes and Fairy Gardens have really become a love of ours. Check out some of our other cute upcycle garden ideas! Upcycle craft projects are the best, not only are they FREE but you are teaching your children to be a little kinder to our world, as well ask making do and using up what you already have. Milk cartons are great for this because they can be used in so many ways like our Fairy or Gnome Home HERE . The kids and I thought this old carton would make a great bird feeder since we also enjoy treating our special feathered friends. 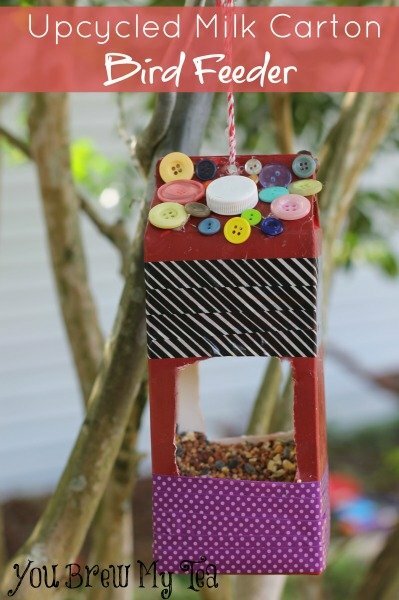 Make your own Upcycled Milk Carton Bird Feeder. Wash your carton thoroughly inside and out, I add a cap of bleach to some water inside, replace the cap and swish it around well for a couple minutes to kill any bacteria inside. Then rinse the inside and outside well. 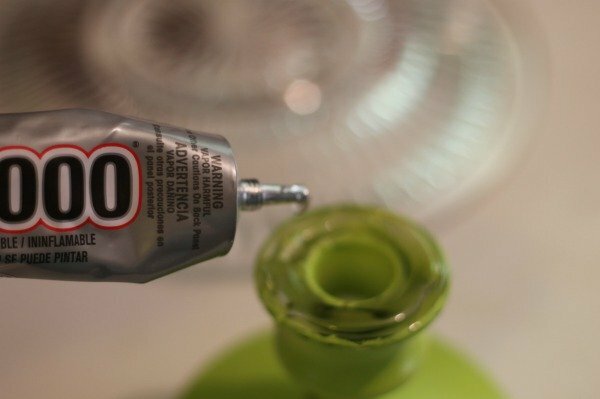 To help the paint adhere better wipe down the outside with alcohol to remove oils, and fingerprints. I recommend cutting out the food windows after you paint so the inside stays clean and paint does not flake off into the food. 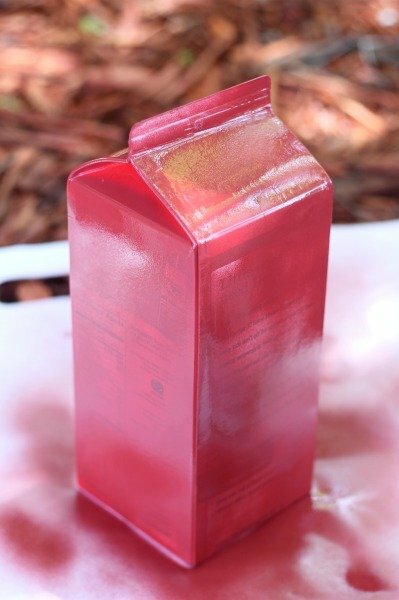 Take your carton outside in a well ventilated area, place on paper and lightly spray with the first tack coat, allow to dry for 5 minutes. Repeat 2-3 more times until well covered. After final coat allow to dry for 2 hours. You can also let the kiddo’s paint by hand with acrylic craft paint- I have found the spray paint covers better. Once completely dry the real fun can begin, pull out tons of embellishments from your craft stash or let them collect items from the yard like leaves, sticks, pinecones, etc. First, cut out 2 generous openings on opposite sides with a sharp knife or scissors. This will serve as the birds perch and serving window. Now, this next step I didn’t do in the right order so, learn from my mistake. 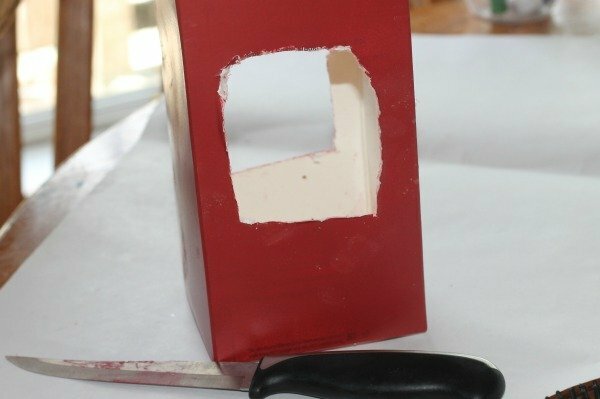 Cut a hole in the top of your carton using a single hole punch , or you can poke through with a knife. Do this step before covering your “roof” or you will have to remove and replace some of your decorations. Next let imagination take over and add any embellishments you wish to create your bird feeder- make it fit into the nature around it in your yard, create a French bakery, fast food drive through, or let them freestyle it with whatever they want. Run a sturdy piece of twine or rope through the hole up top for a hanger, fill you feeder with bird seed and hange from a solid branch. This project is one that brings double pleasure, once while you make it and again watching all the sweet visitors that will flock to your yard to feast! 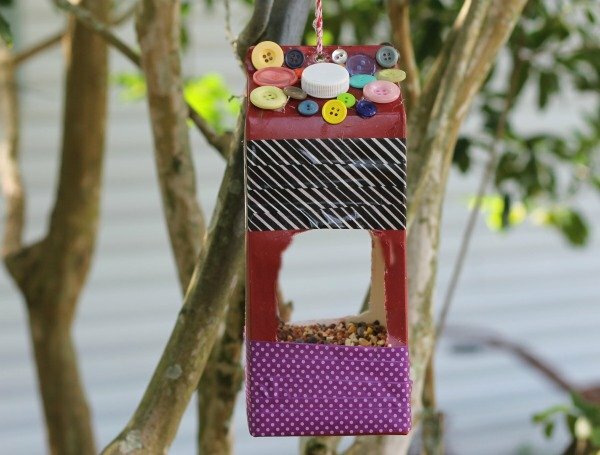 Not only are we upcycling and making a milk carton bird feeder that is much needed in our yard, we are creating a fun backyard project that will bring joy every day. The chance to watch birds eat from the feeder will be a great way to teach your kids all about the different birds in your area and their habits. 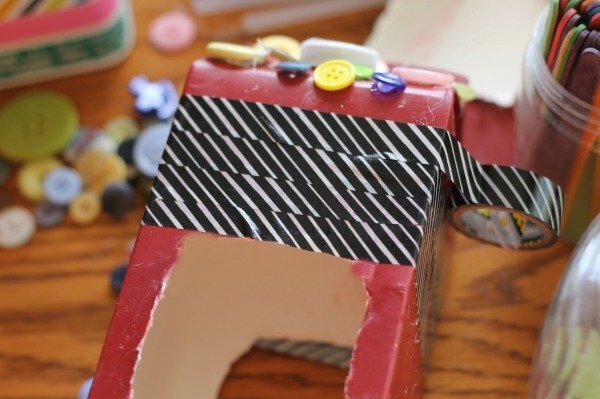 Check out some of our other favorite kids activities & upcycle crafts!